WINSCRIBE 2000 will operate on Windows 3.1, 3.11, 95, 98, XP, or NT systems. It requires 5 MBs of disk space. The program is archived in WS2000.ZIP which is 3.5 MBs. Click on either of the two icons at the top of the page to download WINSCRIBE 2000. WinScribe DOES work with Windows 2000 or Windows XP. 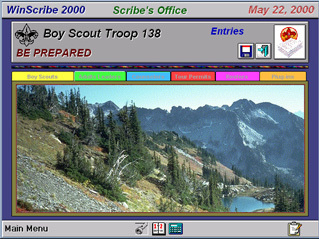 Information and Tips With WinScribe, you can easily keep up with Scout records, keep track of adult leader information as well as information on merit badge counselors, fill out and print tour permits, and make up event rosters. There's also expansion capabilities built in for future plug-ins.